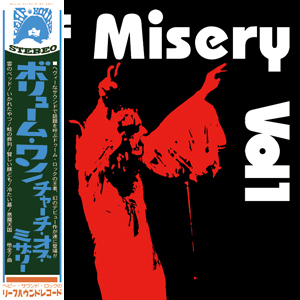 The very first album from Church of Misery is now available from the Japanese label Leaf Hound Records on vinyl only! There are two versions - a ‘die hard edition’ (ltd. 50 – now sold out) and a ‘normal edition’ (ltd. 450 – still available). Both editions come on 180g heavy black vinyl and include a 7” (Race with the Devil) on 70g heavy black vinyl. The die hard edition doesn’t feature more music but extra heavy gatefold sleeve with pop-up representation of serial killers and silkscreen printed black denim outer sleeve! Church of Misery originally recorded the album in 1996 and it was meant to be an official release but Doom Records put it out on a highly priced CD-R without permission (bastards!). But now the first output from this Japanese serial killer band can finally be heard as intended. Church of Misery is Black Sabbath worshippers (even the sleeve is similar to Vol. 4). A fine slab of doom rock with some nice Tony Iommi alike killer riffs. Still I prefer their later records to this one. Basically because they’ve improved along the road even though the band has undergone several changes (only the bass player, songwriter and master Tatsu Mikami is still in the band). If you are huge fan of Church of Misery don’t miss this one but if you are newcomer to their doom universe go for ‘Master of Brutality’ or ‘Early Works Compilation’ instead.